Theaster Gates, “Boli, a Portion of the Team Lives in Heaven”, 2014. 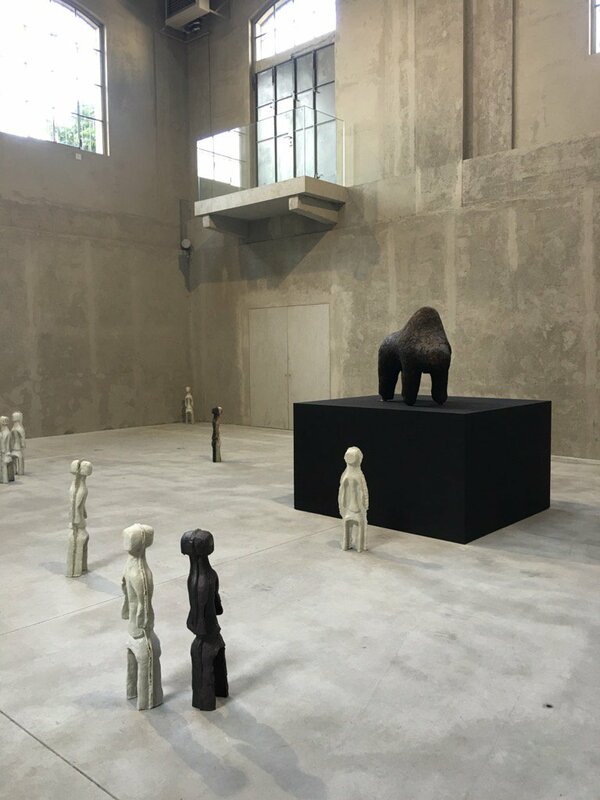 Last year, I wrote how Theaster Gates won the Artes Mundi 2014 prize (info) with a work incorporating a Bamana boli figure. 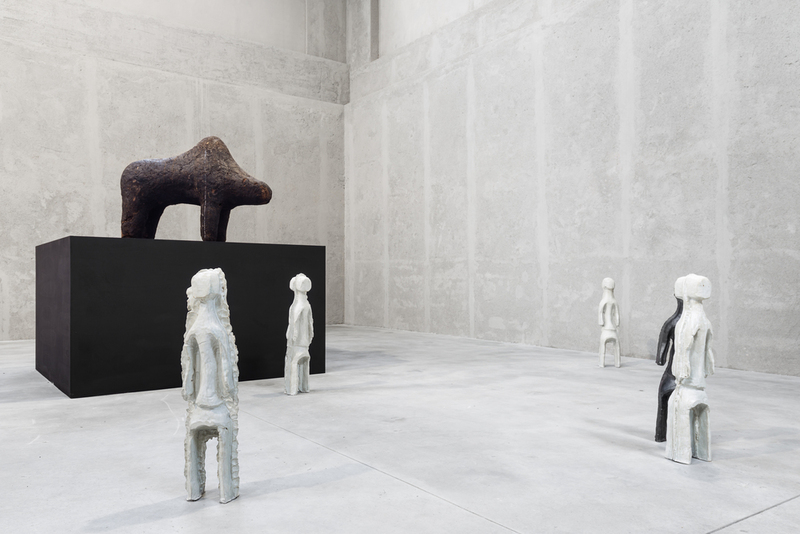 For his current exhibition at the Fondazione Prada in Milan, Gates has again used the image of a Bamana boli figure in an installation. Boli, a Portion of the Team Lives in Heaven shows a group of Mumuye-like standing figure surrounding a magnificent boli figure on a large black pedestal – a very remarkable view. Gates first exhibition in Milan (info) runs until 25 September 2016. Let me know if you find out the meaning of this installation. If you feel that any religion or belief system “works” just as well as any other, as long as its’ followers believe in it, then this installation illustrates that quite well. The artist could have made up a God and his followers, and for the average viewer the Boli and Mumuyes might seem to be just that, but for those of us in the African art world the tribal images add another layer to the art work while preserving the enigma for everyone due to the “otherness” of the objects. This entry was posted in Exhibtions and tagged Bamana on July 25, 2016 by admin. Apologies – save the date – happy holidays ! my apologies for the lack of post these last few months.. with a new book, two sales, two kids and a lovely wife, life has been rather hectic these past few months. While still on my mind, my heart and soul had other priorities than this blog. I do hope to spend some more time on it this summer! As always, there are plenty of exciting things going on in the African art scene. In the meantime, we’re already working hard on our December sales – yes, plural, as we’ll have two again! On Tuesday 13 December, we’ll have our Various Owners sale – which will be presented in an exciting new catalogue format. And on Thursday 15 December, we have a very very exciting Single Owner sale. Highlights of both sales will be presented during Parcours des Mondes at Christie’s HQ in Paris from 8 to 13 September. There’s some more important news coming after the holidays. Don’t hesitate to get in touch, if you would like to consign objects for our December auction. But for now, let me just wish you a great summer, full of joy, good company and great art. ps some more African art in pop culture: the below screenshot comes from the trailer of the new Tarzan movie. 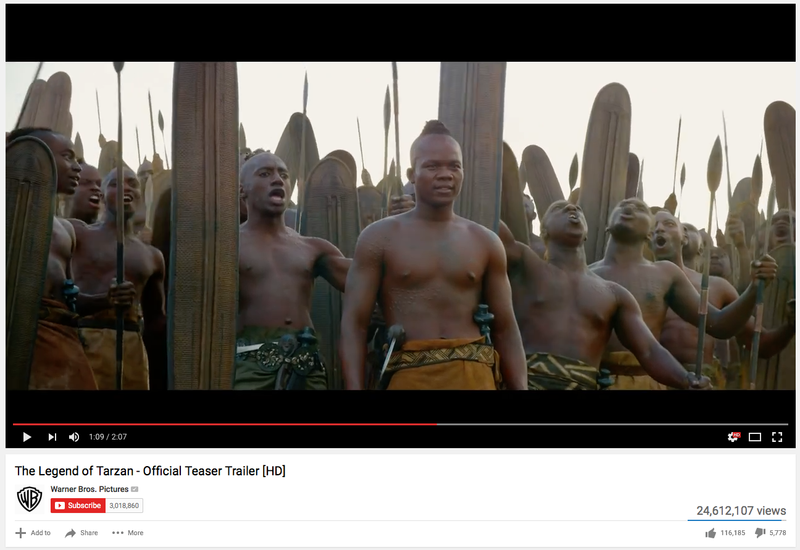 Spot the Mongo wickerwork shields and Kuba daggers (and what look to be Pende axes) – I believe some parts of the movie plays in Congo. Funny they mixed the weapons of several cultures. This entry was posted in News on July 24, 2016 by admin.